The idea sprang from reading about early coffee houses in England. Coffee Houses were immensely popular gathering places for men. Customers tended to cluster like social cliques: you had establishments where artists gathered, places for merchants, and even coffee houses where a man could arrange an interlude with a prostitute. Yet, a woman in a coffee house was a societal no-no. While women worked at London's coffee shops, there is only one woman on record as owning a coffee house (during the first 150 years coffee was in London). Who was that brave woman? This was a major prompt for my character, Claire Mayhew, coffee house owner and a reluctant Cinderella. 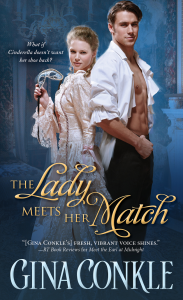 Claire Mayhew and Cyrus Ryland were secondary characters from Meet the Earl at Midnight (book 1 Midnight Meetings series). They often pop into a scene uninvited. In every book that I've written, they flesh themselves out on the page without much effort on my part. A secondary character, Juliette Sauveterre, showed up out of nowhere in this book and now she'll get her own story. Miss Mayhew shook her skirts. He frowned, taking great swipes at the mess clinging to his breeches, not liking the truth of what she said. “Be reasonable. Even coming here in a hack”—he winced, turning his throbbing head for a view of his back—“can be a bad risk.” He tried to clean the sawdust from his shoulders. She peeked up at him around his arm, her pretty face impertinent among all that untamed hair. Her tone and bearing matched the prim coffee shop proprietress, but the view was pure brazen tavern maid at the end of her day. His arms flexed. So, the East Ender gave him up. He wanted to thrash the lad for doing something so foolhardy as bringing Claire here. Too many bad things happened to women in this ward, even those who lived here and knew their way around. Claire placed a hand high on his arm while her flimsy linen cleaned him. She made small, soft sweeps low, where his spine met his breeches. Her skirts brushed the backs of his exposed calves, something more intimate than their first dance. A wicked need to tease her struck, lightening his mood. The swiping slowed. Her hand on his arm lifted, and the loss left his skin cool. Perhaps he went too far. Then her palm rested on his ribs, settling there with discovery. The heat of each curious finger splayed provocatively on his flesh in a lover’s exploratory touch. A heady rush followed, sending a pleasant burn over his already-hot torso.